This simple meal should certainly fill you up after a day of sledding, snowmobiling or a day in the cube farm. Preheat oven to 350°. Cook potatoes on high heat in microwave for 6 minutes. Flip and cook for 6 more. While the potatoes are cooking brown grass-fed beef over medium heat in a large skillet. Once cooked through, remove and set aside. In that same pan heat 1 Tsp. olive oil, add mushrooms, and onion. Continue to cook until onions become glossy. 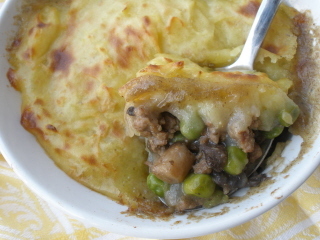 Add peas, cooked beef to the mushrooms and onions. Stir until heated through, then add mushroom soup and stir to combine. Add equal portions of meat mixture to 4-16oz. ramekins, and set aside. For potatoes mash cooked potatoes in medium size mixing bowl. Once they have reached your desired consistency stir in yogurt, butter, and garlic. If it is too thick, add a little milk, or chicken stock. Divide mashed potatoes among the ramekins already filled with the meat mixture. Place ramekins on a cookie sheet incase they overflow in the oven. Place on the middle rack for about 25 minutes. To get potatoes to be golden brown, broil them for about 2 minutes on the top rack in oven.